This remote peak is placed on a well trodden path and remains a sure way to reach 6000m. Stok Kangri is not technical and allows you the opportunity to climb at higher altitude in a simple and straightforward climb. For those looking to take the step-up from trekking and move onto climbing this is the perfect first experience. A combination of altitude and weather conditions make this a challenging objective and is ideally suited for someone who has done a beginner climb. 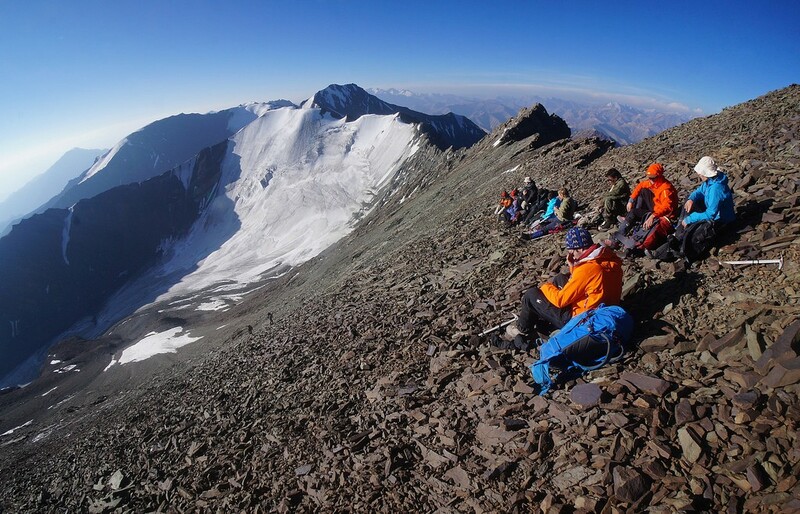 Once you’ve climbed Stok Kangri you will have gained the necessary altitude experience to climb higher, bigger, and more challenging mountains, such as Mt. Nun, Aconcagua, and Kyajo Ri. Arrive in Delhi in the afternoon. Transfer to hotel for check-in. Transfer from Delhi to Leh. Check-in to hotel and spend a day. Spend the day here at your leisure exploring Leh. Khardungla / Warila day trip for further acclimatization. Drive to Shang Sumdo ( 3800m)- 1 ½ to 2 hrs and begin trek to Chuskyurmo ( 4140m). Follow the Shang river upstream through a nice gorge and come out at Chogdo ( 4021m)– 5 hrs. From Chogdo we turn towards the west into a tributary valley which leads after a long and gradual ascent to the Gyuncho La at 4700 metres. Descending from the pass, we make camp at Shang Phu at an altitude of 4365 metres. A total of 5 to 6 hrs walking. A tough day today as we climb 900m . Today we climb to cross the Shang La (4960m) and then descend to the Tokpo River for lunch. After lunch we trek generally downhill contouring around spurs and over a 4550m pass to our camping place at Matho phu (4433m). 6/7 hours walking. Again we have a steady climb in the morning, this time up to the Matho La (4820m) and then we descend into the valley to the north of Stok Village. O/N Smankarmo ( 4380m) – 4 hrs. Rest day. We take a hike to 5100m. Around midday we we rest and optional further hike around the area for further acclimatization and practise using crampons. We will leave a little past midnight of day 11. 2 hrs to high camp and then we trek across the glacier and climb up to the col. From here it’s a steep and we will rope up and climb steadily to the summit marked with prayer flags ( 4 – 5 hrs from High camp). Either descend via the same route or if the conditions are fine we can descend direct down the scree slope. Return to Base Camp. Descend to the village of Stok ( 4 ½ to 5 hrs) where we get to visit the Stok Palace Museum. Here vehicles will be waiting to drive you to Leh. The paths are well defined, rocky and grassy up until the snow line around 4000m. Glacier crossing and gentle snow/ice slopes and rocky ridges to the summit. The weather is usually sunny during the day in summer months with snow/cloud cover expected in the afternoons. At 6153m, the mountain is large enough that the weather can change within a matter of hours. Temperatures can go down to 0 deg. at basecamp, and below 0 higher up.